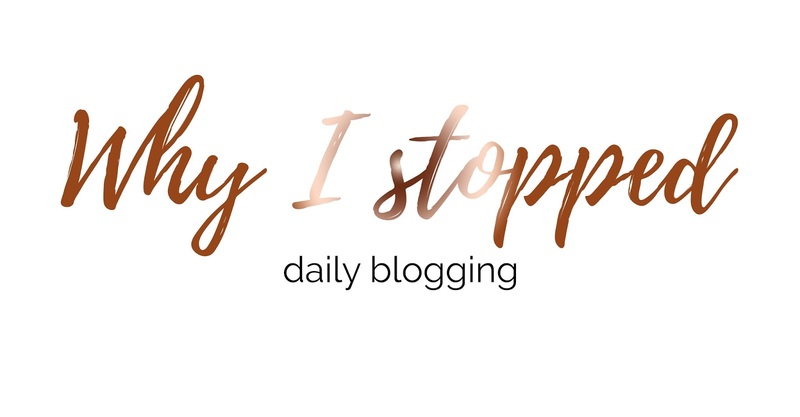 Something I wanted to explain here on my blog is why I stopped daily blogging. Now some people may not have realised that I stopped posting every single day, as sometimes I do post daily; it all depends on what's going on in my life, whether I've had the time and how I'm feeling. So recently I had to battle through at least three months of bloggers block and the constant feeling of feeling crappy about my blog and the feeling of not knowing where to go, what to write or how to get started. Therefore, I took the weekend off after having a discussion with my best friend and I though enough was enough. I needed a break, I needed to enjoy my weekend and to then come back to blogging with a fresh mind. Now, this was all well and good until I was ridiculously tired one day after having a very very busy day and I didn't have time to post, the next day I then had work so I still couldn't write anything up. By the time I had the chance to write something up for that day it was 9pm and I thought it was far too late, so I didn't post on that day. I felt extremely disheartened and guilty for not posting but I realised that actually it's life. Sometimes life does get in the way, we don't always have time and things do come up and stop us from doing what we want to do and this is completely okay. It happens to everyone so after that stage I was okay with not posting and I didn't push myself to post every single day even though I was shattered and typing before I went to sleep. Don't get me wrong, I absolutely love daily blogging and blogging in general and apart from not having enough time; it's incredible. However, if I don't post on one day or even if a post goes up a little bit later than usual, I will be completely okay with this. Although I didn't succeed blogging every single day, I've still done more than what I ever thought I would and I've met so many more goals which I created back in the New Years, so to me I have achieved and I have succeeded. I'm not going to have set days on when I'm posting however I will of course let you know on my social media (most likely my twitter) if a post will be going up the next day or whether I won't be posting. But for now, I have time, I'm motivated and as long as the time sticks to going slowly I'll be posting every single day unless something comes up and gets in the way! I hope you continue to have a brilliant day and thank you for being so patient with me! I totally understand where you're coming from -- for the first half-year or so of blogging, I posted five days a week, and started to feel the same sort of pressure. Now I post 2-3 times a week and feel a lot more inspired! I started off with daily blogging and soon realised this wasn't going to work for me. I know post every Thursday routinely and then depending on Awareness weeks or days I will post sporadically to promote those. I love your layout and theme by the way. Lush fonts too. It's totally fine girl, but I know exactly how you feel! When I mentally tell myself i'll post a certain number of times a week and then I end up not being able to I get the blogger guilts. But I had to realize the same thing: that life comes first and sometimes things do get too busy. You do SO WELL for posting most days, I take my hat off to you! I loveee your blog. I could only hope to blog daily, 2 times a week proves a struggle for me. Much respect to you lady, missing the odd day is nothing! Looking forward to seeing what you post in future!